Go! Northwestern win that game. Hail to Black? Hail to Gold? Not at Northwestern, you say. Not now, of course. Everyone knows that Northwestern’s colors are purple and white even if they don’t know the lyrics of the University’s Alma Mater. But it wasn’t always so. In fact it’s not so now. Northwestern only has one official color, royal purple. This has been the case since 1892, despite the fact that with the passage of time, tradition has firmly established white as a de facto if not de jure official color. Had it not been for the fact that black and gold had been adopted by other universities, the Norris Center Bookstore might well today be stocking beer mugs and other paraphernalia in those two auspicious colors. The decision to scrap black and gold as NU’s colors was made more than 100 years ago, in 1879. Why was it made? The original impetus for colleges and universities to adopt official colors evolved as a consequence of the flourishing of intercollegiate athletics during the decade immediately following the Civil War. 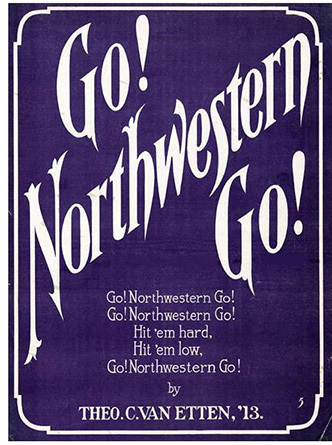 Indeed it was only with the development of football as a major sport in the 1870s that students at Northwestern felt compelled to select a University color to distinguish themselves and their teams on the fields of play. It seems that in the fall of 1879, following the lead of many Eastern universities, a committee chose black and gold as NU’s official colors since its membership was unable to agree upon a single color. Shortly thereafter it was discovered that other schools had preempted those colors, and the Northwestern committee met again and selected purple and gold in their place. For the next 13 years Northwestern teams went forward under purple and gold banners until 1892, when another University committee reduced the official color to just royal purple, apparently in emulation of the custom adopted at various of the prestigious Eastern universities. Gold continued to be used in concert with purple on academic regalia, but sometime shortly after 1892 white became the University’s second (and unofficial) color, and it has been ever since. Those who have seen the fearsome Black Knights of the Hudson storm onto the field attired in their black and gold uniforms during the Annual Army-Navy football game have had a glimpse of what the scene might have looked like at Dyche Stadium on any Saturday afternoon this autumn had it not been for a momentous decision made by a committee of students over 100 years ago. Adorning a myriad of University related or generated items ranging from beer mugs and window decals to letterheads and diplomas is the official University seal. This logo, considered by students and faculty at many other American colleges and universities to be one of the most aesthetically pleasing of its kind, is quite familiar to most members of the Northwestern University community, yet few are aware of either its genesis or its meaning. Even those who can readily visualize it concede that its origins have been obscured in the haze of antiquity. On June 26, 1856, only six years after Northwestern was founded and as its first year of holding classes had just come to a close, the University’s Board of Trustees adopted a design for a corporate seal that would be affixed to official University documents. 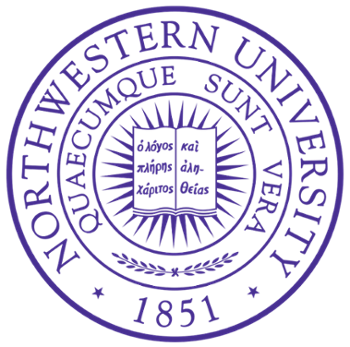 This first seal closely resembled an incomplete version of the present one; it consisted of “an open book with rays of light surrounding,” enclosed by the words “Northwestern University, Evanston, Illinois.” This motif, similar to the University of Wisconsin’s well-known logo Numen Lumen (new light), quite obviously suggested the illuminating influence of the impartation of knowledge. In addition, Bonbright removed the words “Evanston, Illinois” from the seal and added the date 1851, which denoted the year that Northwestern received its charter from the Illinois legislature. Bonbright’s revised design was approved by the board on December 5, 1890, and became effective on New Year’s Day of 1891. Since then, it has served faithfully as the graphic symbol of Northwestern’s commitment to the educational, ethical and moral values embodied in its design.